Keep bedrooms, playrooms, and closets organized with with this 2-pack of RiverRidge Kids Soft Storage Bins. This set features 2 large-capacity bins that hold toys, games, art/craft supplies, clothes and more. Keep in the kids room, family room, or any room in the house that could use extra storage. They fit on a closet shelf, bookshelf or desk. 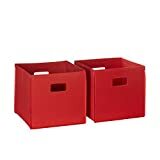 Each set includes 2 red bins with open cut-out handles; bins fold flat when not in use.